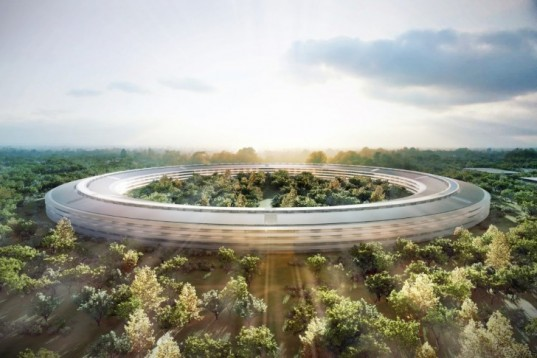 2014-09-30 2014-10-03 thesustainableinvestor1 Comment on Apple’s New HQ: The Greenest Building on the Planet? Apple’s New HQ: The Greenest Building on the Planet? Nicknamed the “Spaceship” campus, Apple has been building a new home in Cupertino, California for the past couple years – a project that represents the long-time vision of former CEO, Steve Jobs. The new headquarters will encompass over 300 electric vehicle charging stations, 7,000 trees and multiple solar panel roof tops. Hundreds of acres of greenery will surround the massive, 2.8 million sq. foot, spaceship-like structure. These amenities do not come cheap – Apple has spent an estimated $5 billion on its efforts. The company aims to source 100% renewable energy and claims they are recycling over 90% of the old headquarters to build the new. The new HQ plans to save money on heating and cooling by using natural ventilation for 75% of the year. According to Forbes, “A drone flew over Apple’s new campus, and what it saw was amazing”. (Apparently, California does not currently consider low altitude flights to be trespassing). 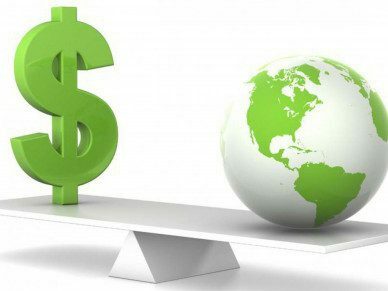 This past February, at Apple’s annual shareholder meeting, Justin Danhof of the National Center for Public Policy Research (NCPPR) asked Cook if the company’s green initiatives would procure profitable returns on investment. The NCPRR, a self-proclaimed “conservative think tank”, firmly believes that corporations should solely engage in activities that maximize dividends to shareholders. Cook’s response? “When we work on making our devices accessible to the blind, I don’t consider the bloody ROI. If you want me to do things only for ROI reasons, you should get out of this stock”. Bryan Chaffin, a writer for The Mac Observer who happened to be in attendance, later detailed, “What ensued was the only time I can recall seeing Tim Cook angry…as evidenced by the use of ‘bloody’ in his response – the closest thing to public profanity I’ve ever seen from Mr. Cook…to me, it was a clear rejection of the groups’ politics…it was also an unequivocal message that Apple would continue to invest in sustainable energy and related areas”. The idea that investors are only just now unearthing Apple’s sustainable efforts is ridiculous. In addition to the media around the manner in which Tim Cook and Apple embrace sustainability, the company also consistently publishes reports on its environmental footprint, materials used, and renewable energy endeavors. Not to mention the now three-year-long mission of creating the world’s greenest building. Great post! I think it would be a neat idea for there to be a competition to see what is the greenest corporate HQ in the US, in the world. Get architects, energy efficiency experts and the like to grade the participating HQs on as objective a scale as possible. Sounds like Apple’s new structure would certainly be in the mix. As to the investor group’s reaction, it’s always interesting to me that so-called CONSERVatives, who have benefitted financially and probably personally from scientific advances, are pro-science–except when it comes to climate science. To paraphrase the question that young Jewish boys ask at the Passover seder, “why is this science different from all other science?” What do you think the answer is? Next Silicon Valley severs ties with ALEC…who’s next?